The Christmas Bear Ornament is a companion project to the 2016 Christmas Bear "Shelf Sitter." Our Christmas Bears have been favorite collectible projects for woodworkers since 1997. You can personalize your ornaments with the date you make them and continue the collector tradition. They are great gifts to make and give to someone for Christmas - or make them for yourself! 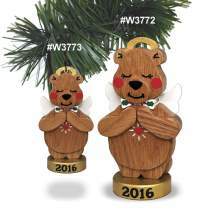 #W3773 Christmas Bear Ornament 2016 is a smaller version of the #W3772 Christmas Bear but is designed to hang on your tree rather than sit on a shelf. Ornament measures approximately 5" tall and is made from 3/8" stock and a piece of 1/8" oak for the overlays. Shelf Sitter measures approximately 7-1/2" tall and is made from 3/4" stock and a piece of 1/4" oak for the overlays.